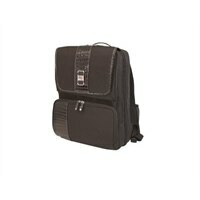 The ScanFast Onyx Backpack from Mobile Edge is the only women's Checkpoint Friendly Laptop Backpack on the market! This TSA compliant backpack is designed specifically for women and incorporates all of the high-end features into one comfortable, stylish package! From the exclusive SafetyCell laptop protection compartment, to the wireless security shield, the ventilated padded back panel and hide-away water bottle holder, the Onyx Backpack has everything you need when you are on the go.